New mixed-use project to be a primary component of the revitalization of Mount Pleasant’s “Main Street”. The Boulevard combines residential and retail spaces with walkable streets and proximity to nearby restaurants, shopping, schools and the beach. 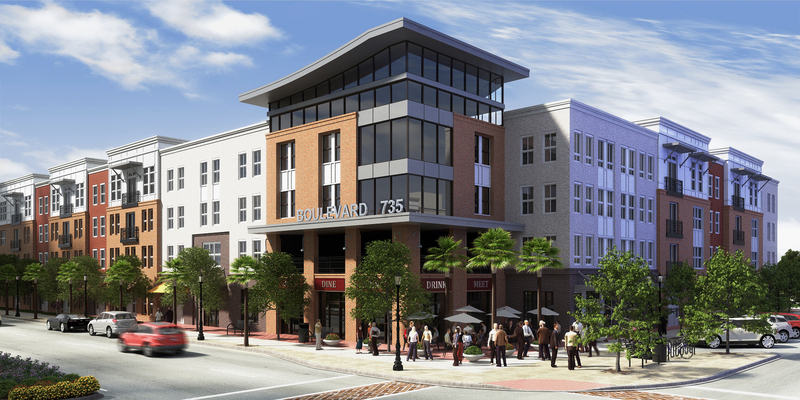 The Boulevard is a mixed-use apartment and retail community located at 725 Coleman Boulevard in Mount Pleasant, SC. One of the first commercial properties sparked by the Coleman Boulevard Revitalization Project, The Boulevard combines residential and retail spaces with walkable streets and proximity to nearby restaurants, shopping, schools and the beach. An official groundbreaking ceremony is scheduled for Tuesday, March 20 at 10:30 am. At 725 Coleman Boulevard, The Boulevard’s location has an eclectic history. It’s the former site of the Family Dollar, and prior to that, home to the Red & White Market and Rodenberg's Grocery, one of Mount Pleasant's first supermarkets. Proximity is a major feature for The Boulevard as it’s just five miles from downtown Charleston, five miles to Sullivan’s Island and immediately accessible to public transportation, the Mount Pleasant Farmer’s Market, Shem Creek, and neighborhood dining, retail and entertainment destinations. As an infill development, The Boulevard reinvigorates an existing site, rather than clearing pristine land. In addition, The Boulevard is being designed with sustainable practices, including the preservation of old-growth trees. The Beach Company (and its affiliated entities) has owned the land on which The Boulevard resides for nearly 50 years. For more than 65 years, The Beach Company has been a leader in residential and commercial real estate, development and property management and is proud to be part of the Coleman Boulevard Revitalization Project. There will be 325 new, urban apartments where The Boulevard residents have the freedom to choose the space and floor plan that meet their needs – from studio apartments to three bedroom flats. In addition, a limited number of units will be offered to those who qualify for workforce housing. Residence amenities include gourmet kitchens with stainless steel appliances, 9’-12’ ceilings, a commercial quality fitness center, courtyard pool and indoor/outdoor clubroom overlooking Coleman Boulevard. The Boulevard will also offer residents an array of new entertainment, neighborhood shops and restaurants where they’ll take advantage of outdoor dining opportunities along Coleman Boulevard’s newly enhanced streetscape. With construction kicking off this spring, The Boulevard anticipates its first units will be ready for move in by early 2013. Prospective residents interested in learning more about apartment rental opportunities are invited to contact Heather Eichelberg at 843-722-2615 or heichelberg(at)thebeachcompany(dot)com. Business owners interested in being part of The Boulevard’s retail community are encouraged to contact Carl Harrison at 843-722-2615 or charrison(at)thebeachcompany(dot)com.